A major step towards HMRC’s ambition is the introduction of Making Tax Digital for VAT. The exception to this is a small minority of VAT-registered businesses with more complex requirements. As part of planning for the VAT pilot, HMRC continued to engage with stakeholders and listen to their concerns about business readiness for Making Tax Digital. We have made the decision to delay mandation for these customers until 1 October 2019 to ensure there is sufficient time to test the service with them in the pilot before they are mandated to join. How Can Ward Goodman Help ? Ward Goodman’s tax accountants has been providing the people and businesses of Dorset and Hampshire as well as much further afield, a trusted tax service for over 30 years. Our taxation specialists are highly skilled professionals who are focused on providing clients with a competitive compliance service and proactive tax consultancy. We are fully committed to offering a cost effective compliance service that when coupled with consultancy from our tax accountants will ensure individuals and businesses organise their affairs tax efficiently. Tax agent. The role of tax advisers will change as we move from preparing tax returns to managing tax accounts. The review of information HMRC populate the digital tax account with and uploading accounts information to HMRC will be particularly important in the early years of implementation whilst kinks in the system are ironed out. The account management role is unlikely to lessen in the future when it comes to checking that Budget announcements have been correctly integrated with your digital tax account. Record keeping and reporting. Ward Goodman already assists a large number of clients with their record keeping and reporting. Quarterly reporting will place a real burden on some businesses which Ward Goodman are well placed to help manage and implement via our accounts, outsourcing and tax services. Software buffer. The integration of personal accounting software to the HMRC system remains unknown in many respects. Ward Goodman is able to act as a buffer when providing details to HMRC. Advice. Our more traditional role as advisers remains unchanged. Making tax digital aims to simplify the reporting process, but the legislative background is still complex. Helping clients understand this and dealing with future Budget changes will continue to be a big part of our work. 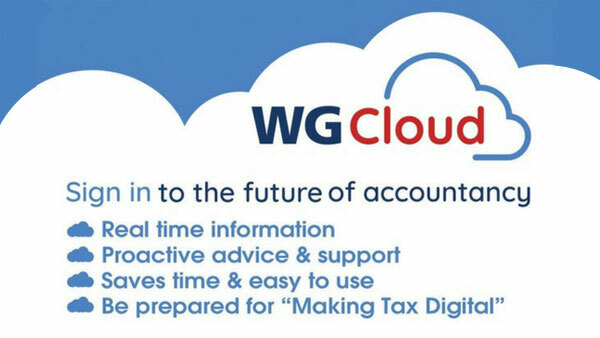 WG Cloud – This is our way of offering accountancy services to clients utilising cloud software. By making processing more efficient, cloud software allows us to give you advice on a more regular basis which can add value to your business. How Has This All Come About ? On 18 March 2015 HM Revenue & Customs (HMRC) published a policy paper titled ‘Making tax easier: The end of the tax return’ which set out, in broad terms, the plans being put in place to modernise the tax system. In the intervening year very few announcements have been made, but we will bring together here what is known and set out how Ward Goodman is looking to help its clients through the transition. In short there is a lot of tax at stake which, under the current governments austerity push, requires collection in a more efficient manner than is perceived as being possible within the current system. HMRC collected close to £515 billion in total tax receipts for the 2014/15 fiscal year, using around 58,000 staff operating out of 170 local offices to do so. Of the total tax receipts £280 billion came from Income Tax, Capital Gains Tax and National Insurance Contributions. Whilst most pay these ‘personal’ taxes directly to HMRC out of their monthly salary, those who do not have a monthly salary taxed under PAYE (such as the self employed) or have other income to declare (landlords, for example) must file an annual tax return under Self Assessment. The introduction of Self Assessment some 20 years ago was the last big change to the tax system. It was introduced in the mid-nineties with the intention of making the calculation and collection of tax simpler for the tax payer. It also shifted the burden and cost of this from the then Inland Revenue to the tax payer. The most recent figures from HMRC show that for the 2014/15 tax year a total of 11.26 million Tax Returns were due to be filed of which 10.39 million were received on time. Of the filed Tax Returns 89% (9.24 million) were filed online with half of these (4.45 million) being received in January. HMRC has committed to saving £717 million every year through to the end of the current parliament. In order to deliver this HMRC have announced their intention to close the local offices and replace these with 13 regional centres, reduce the size of their workforce and invest £1.3 billion into making tax digital, which will include the ‘digital tax account’. Simplifying tax. HMRC will populate the digital tax account with information they already hold (such as earnings from employers) or can gather from third parties (such as interest earned on bank accounts). Digital business. Businesses will have access to software and apps to manage their records and be able to link personal accounting software with the digital tax account to update HMRC on a quarterly basis. Tax in one place. The digital tax account provides a single point of contact for managing all taxes. Real time tax. Quarterly reporting will create more of a ‘real time’ basis for the calculation and payment of tax by individuals and business rather than the current annual filing and payment arrangement. The creation of the digital tax account is already underway with basic versions due to become available for access to every individual taxpayer by April 2016. Security. As digital tax accounts are developed HMRC will have increasing access to personal information, particularly through the proposed link to taxpayers accounting software. Ensuring data integrity and security will be a critical factor for many. Explanation and access. In light of reduced staff numbers, more regional tax offices and a very poor customer service history the management and explanation of the transition to digital tax accounts will also be key. Also, over one million people filed a paper Tax Return in 2014/15 and those individuals who are either unable to access, or do not want to have, a digital account will need to be accommodated. Record keeping and reporting. It seems the new reporting timeframe will be on a quarterly rather than an annual basis. It is not yet clear how time consuming these quarterly reports for businesses will be and how this will reconcile with the calculation of annual taxable profit, when adjustments such as private use, prepayments, accruals and capital allowances are taken into account. Implementation. The move to digital appears to be a bottom-up approach with smaller businesses moving to the new digital platform before larger ones. This places a large part of the administrative burden of the change on businesses that might not have the capability to accommodate such a change, particularly as it seems the transition for businesses will be compulsory and not voluntary. Software. HMRC have promised to make software available at the point of use. However, whether this standard package is suitable for all business is not clear and nor is how it is intended for this to integrate with personal accounting software and what sort of access it will have to these records. Historical performance. The introduction of Self Assessment was the last big change to tax administration and was not without its troubles. Whether it improved life for the taxpayer is up for debate. More recently HMRC have had trouble implementing new software systems for PAYE Coding Notices and PAYE Real Time Information systems, much smaller projects by comparison.